As I was working on a profile for a client, it occurred to me that it’s important to know how to manage your LinkedIN recommendations for a more accurate and streamlined profile. One thing I’ve noticed before is that it’s not uncommon, when you request a recommendation from a former colleague, supervisor or client, that it can appear under the wrong job title. Other times, I’ve seen profiles with duplicate entries so as to retain the recommendations under each – a definite no-no, unless you want to confuse your target audience. Let’s say I requested a recommendation from George, a former client at Digital People. You’ll see his recommendation was placed under the Talent Manager position at Digital People. But whoops! I really wanted that to go under the Operations Manager position at Digital People. I don’t want to go back and request another recommendation from George. Luckily, there is a way to manage your recommendations and move them around between roles. Basically what you’re going to do is delete the position under which the recommendation(s) that you want to move currently lie. But don’t worry, because not only will you NOT lose the recommendation when you delete the position, but you will put the position right back on your profile as well. What happens when you delete a position and there are recommendations attached to it, is that the recommendations simply go into an “unassigned” category, and you can reassign them to an existing role with a few simple steps. 1. Go in to “Edit Your Profile”, and then select “Edit” next to the current position where the recommendation you want to move is located. You will want to copy the details of the role (title, company, description, dates) into a simple text or Word page, so you can copy and paste them later. 2. At the bottom click “Remove this position”. Remember – this does NOT delete the recommendation, it simply sends the recommendation into an “unassigned” folder so you can reassign it later. 3. If the job you just deleted is a duplicate entry, do not do anything else. Otherwise you will now want to add the job back into your profile by clicking on “Add a Position” next to the “Experience” heading. Paste the same details back into the form, and save. 4. Click on “Settings”, which can be found in the pull-down menu under your name at the top right of your screen. 5. Click on “Manage Your Recommendations”. 6. Scroll to the bottom and you will see a heading for “Unassigned Recommendations”. Locate the recommendation and click on “Manage”. From here you will see a drop-down menu listing all of the positions on your profile. Select the position under which you want the recommendation to appear. Presto! You’re all set, and still fully-endorsed! 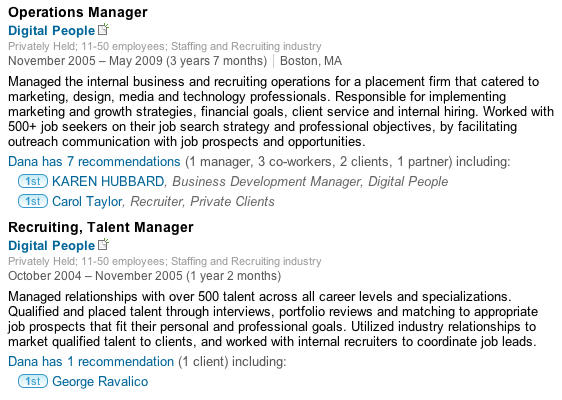 This is a simple way to avoid having duplicate job entries on your LinkedIN profile, which will only confuse your audience and affect the organization and integrity of your profile. Your LinkedIN profile is an uber-important tool in your personal online branding arsenal, so make sure it’s cleanly organized, professional, and tells the story of your “brand” in a way that highlights your top skills, strengths and experience! And if you’d like a little individualized help with your LinkedIN and online branding, simply click here! Goal Setting for 2012: Work For Myself! 1 Comment on "Managing Your Recommendations in LinkedIN"
Concise, practical advice that saved me a potentially akward e-mail asking for the recommender to reassign their recommendation to my other position. Thank you!